d i v e r s i t y w o m a n . c o m W i n t e r 2 0 1 8 D I V E R S I T Y W O M A N 29 for the next generation. Cheryl did that with her efforts around diversity of the academy—which was not easy, as it is very challenging to make changes with a group of very successful people who think things are fine just as they are." Legendary studio executive Sherry Lansing, who was the beneficiary of Boone Isaacs's publicity work on several films when she ran Paramount, says that the changes Boone Isaacs implemented at the academy may represent the pin- nacle of her career. I've known Cheryl Boone Isaacs for over 30 years," says Lansing. "As a producer and, later, as chair of Paramount, I saw firsthand how brilliant Cheryl was at her job. But perhaps Cheryl's most impressive achievement to date was her leadership of the academy. She deftly steered the orga- nization through a period of highly visible challenges and helped solidify its future as a far more diverse and forward-thinking cultural institution." O vercoming obstacles against heavy odds is nothing new for Boone Isaacs. She was raised by her parents to view obstacles as challeng- es and opportunities for growth. Boone Isaacs, who grew up in a middle- class family in Springfield, Massachusetts, was the youngest of four in a tight fam- ily. Her father was a postal worker and her mother a stay-at-home mom. Her life changed when she was a junior in high school, and her sister moved to California to get married. "When we were out there, and there was no humidity, no mosquitoes, and no thun- derstorms, I immediately thought, 'I got to come here,'" says Boone Isaacs. "In my senior year of high school there was a late spring snowstorm, and I said to myself, 'I can't do this one more minute.'" She moved to Southern California to at- tend Whittier College. She knew no one in California except her sister. "Later in life, I realized that I like throw- ing myself in the deep end," she says. After graduation Boone Isaacs turned her attention to the film industry. 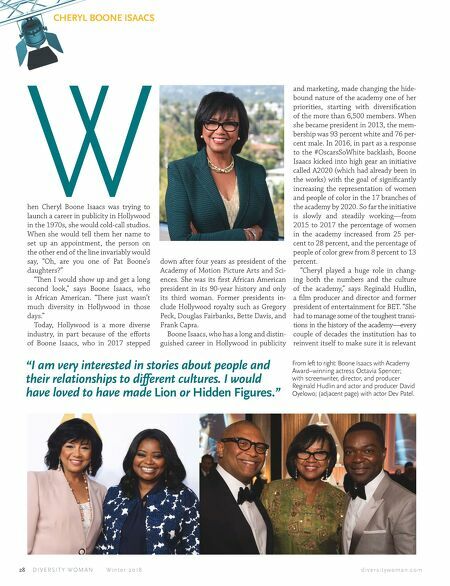 Her older brother Ashley Boone Jr. was already entrenched as a successful motion picture marketing and distribution executive, but she was determined to make her way on her own and didn't use his name in the early stages of her career. Her first job was as a publicist for Co- lumbia Pictures, promoting Steven Spiel- berg's Close Encounters of the ird Kind. It was the first of several movies she would publicize for Spielberg, including the Indi- ana Jones series. "I was such a little pisher, standing in the corner scared to death!" she says. "I was out there, knocking on doors. It was very intimidating, especially as a black woman. ere just was not much diversity in Hollywood back then." Sometimes she was so upset by the slights that she would go home and cry in the shower. at became an indicator. "One of my rules was the minute I cried in the shower, I needed to look for another job," she says. "And let me tell you, it hap- pened more than once." Despite some tear-drenched show- ers, her career took off. Boone Isaacs became executive vice president of worldwide publicity for Paramount Pic- tures, where she was responsible for orchestrating the publicity campaigns for Best Picture Oscar winners Forrest Gump and Braveheart. She later was hired as president of theatrical market- ing for New Line Cinema, overseeing the box office success of films such as Austin Powers: The Spy Who Shag ged Me, and Rush Hour. Hudlin, who first worked with Boone Isaacs in 1992 when he was the director of the Eddie Murphy vehicle Boomerang, a film she was in charge of promoting, says he knew right away that she had what it took to succeed in the cutthroat world of Hollywood. "Paramount in that era was legendary, and she fit in with that team of hard- charging, high-powered executives," he says. "She was very impressive. Boomer- ang was a big summer movie, and Ed- die Murphy was an important asset for the company. She always handled things smoothly, she was always in control, there was no drama, no panic, in what- ever Cheryl was involved in. She had a grip on what to do and how to do it. So when she became head of the academy, I was not surprised at all—it made so much sense." Reflecting back, Boone Isaacs says she can't choose a favorite director to work for, or actor to help promote. Perhaps it's her politic, careful nature—which served her well as the head of the academy. However, some projects do stand out, she says. "Naturally, Braveheart and For- rest Gump were special because they won Best Picture. Forrest Gump was probably the most challenging film I ever had to pro- mote. ink about it. If you see this title— Forrest Gump—what does that mean? How do you sell that to a broad audience?" CHERYL BOONE ISAACS "I was out there, knocking on doors. It was very intimidating, especially as a black woman. There just was not much diversity in Hollywood back then."